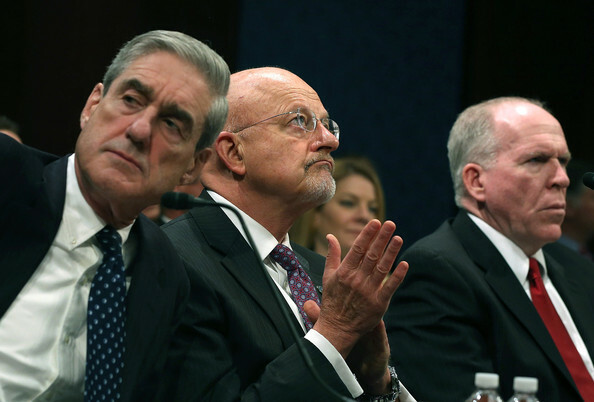 When you look at the roles that Mueller, Brennan, and Clapper have paid, you have to admit that these three men have done nothing but evil all their lives. The roots go deep and on for years. And the reason for this is that the Democratic party has been the party of evil-doing since the murder of Kennedy. And the Republican party has been evil since Lincoln. It’s really only Trump who has broken free and begun to over turn this shenanigans which they pretend does not exist. Bush was no saint, it’s a crime family just like the Clintons, going back to senator Prescott Bush who funded and profited off the Nazis. But it seems that what was happening under the Obama regime was crime after crime after crime at a level that is absolutely abhorrent. Arms to terrorists, Benghazi, and now election meddling and spying. Unmasking. the Uranium deal and the 145 million dollar kickback, and all the billions of dollars in kickback to Hillary’s Foundation in a massive pay to play scheme. And we can’t get ONE arrest? Well no, the DOJ is in on the game and Rod Rapeya Rosenstein is at the helm. So on it goes. We barely know how bad it is and already we are puking. Nothing can change until Rosenstein gets the Boot which hopefully will happen right after midterms. We need NON-DC people in these jobs, fresh blood. Hungry angry people intent on justice. Who aren’t afraid of getting Seth Rich’d. That’s a rare breed. Most people don’t want the hassle. So what can Trump do? He’s in prison as long as the Mueller probe goes on. I suspect that will be shut down if the Republicans win the mids, it simply cannot go on much longer. In the meantime, its a patience game. If they don’t get Manafort convicted, Mueller will start to crumble. And if they do, expect a Trump pardon. It’s an odd time in America. Like a billion tons of weights piled high waiting for one feather to be plucked off so it will all come crashing down. Where will you be the day you see Hillary in Chains? Previous Previous post: Why Is Dating in Thailand Easier ?